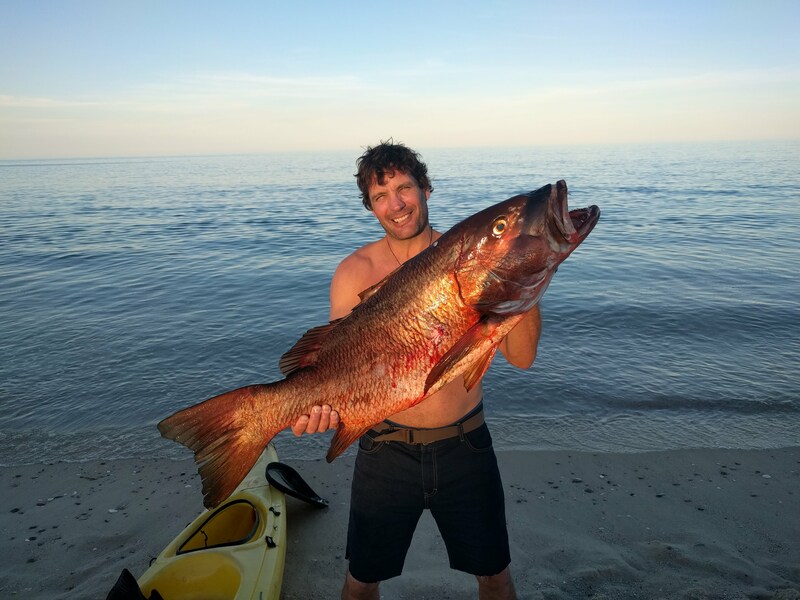 I spent february and march fishing in Baha, these are by far the worse months, but don’t let this stop you from visiting… unless you want easy fishing or are only interested in pelagics… Winter is a time for shooting deep Cuberas, yellowtails and finding the tasty but smallish groupers (15 pounders). The Pacific side is all but off limits during that season, unless you get creative and go out with a boat. In this video I was using an odd version of my normal spearguns. This was a 126 cm Iroko speargun that I originally built has a travel gun. It could be divided but I epoxied the two parts since it the travel idea didn’t work very well. It’s been my workhorse ever since. I sell all the good ones lol. For winter coastal fishing in Baja, I recommend bringing a 130 cm European style gun. The one I was using had tired bands, which were perfect since I often had to shoot towards rocks. I was still able to shoot fish at reasonable distances so it was an optimal compromise. I tried fresh bands but went back to the old ones, more power is not always best. I also brought a 110 and a 150. I shot them only a few times. Seriously, 120 or 130 are the sizes that will be the most useful. I could have tried a 90 for the holes, but I doubt I would have bothered getting it from my kayak. Also, the visibility was limited, so I would have had a difficult time finding the same rock again. Another Baja specific tip: pass the shooting line to the second hole of your shaft. This way you will be able to use your shaft as a slip tip by stringing the large yellowtails that pass close enough. This saved me a few shaft and fish, namely 35+ pound cuberas. Obviously, the shaft is more likely to get stuck in holes, but in Baja you will have to live with that. I was using 7 and 7.5 mm Spear Masters, Rob Allen and Makos. I bent and unbent all them repeatedly. Slip tips are out of the question.